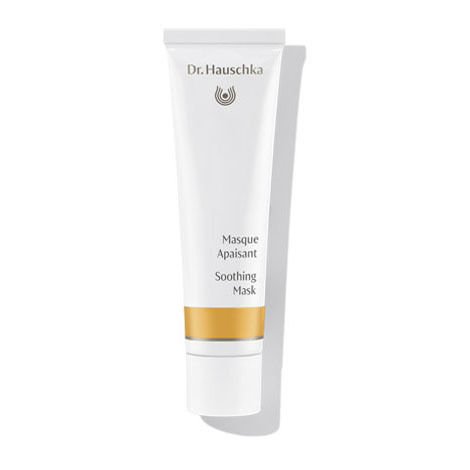 Soothing Mask calms and balances sensitive and irritated skin, as well as skin prone to stress-induced redness, guiding it to comfort and radiance. Formulation: Alchemilla, borage, buckwheat and mullein combine to calm skin. Nourishing shea butter joins macadamia nut and coconut oils to provide protection, while quince seed extract and witch hazel help the skin retain moisture. The skin is noticeably recuperated and sustainably soothed. For sensitive, irritated and stressed skin. Apply a generous amount of Soothing Mask to the face (include eye area), neck and, if necessary, décolleté once or twice a week. Remove after 20 minutes with a warm, damp cloth. For optimum skin care results, we recommend deep cleansing with Clarifying Steam Bath and Clarifying Clay Mask prior to use. This is a very effective treatment for my sensitive skin and ai use it at night especially after exposure to too much sun or wind, or after a late night. I really love this product. My skin is very dry and sensitive and it always calms my face beautifully ?? Only product that calms my skin down during a flare up. I use it daily. I switch between soothing mask and hydrating mask depending on what I need. Soothing mask is so good when I have inflamed or red skin. It leaves my skin feeling soft and soothed. I love this mask. For skin that is particularly sensitive or prone to redness, apply a small amount of Soothing Mask prior to your regular day cream.